Drayton Side Chair, British, c.1750. Post-conservation photograph by Craig McDougal. Courtesy of Colonial Williamsburg Foundation. Gift of Mr. Charles H. Drayton, III. One of two significant pieces of British furniture placed on loan to Colonial Williamsburg for the new exhibit A Rich and Varied Culture: The Material World of the Early South (officially opening this Friday, February 14) is a side chair contemporary to Drayton Hall’s construction (c.1738-1750). 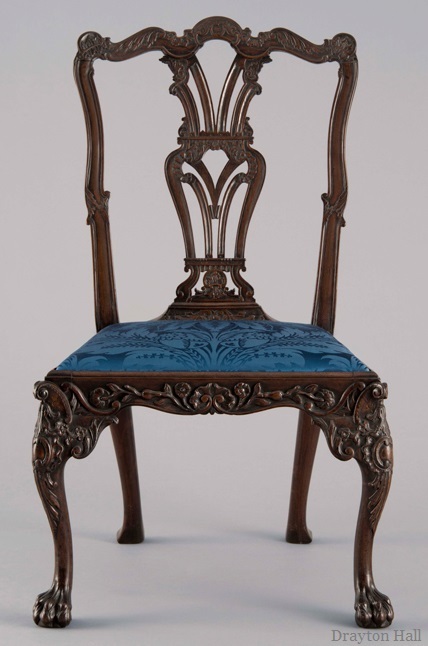 Carved from mahogany and deal and marked with the number 1, this chair is one of four known survivors from an original set of twelve numbered chairs imported from Britain for use in the great hall. Conservation of the wooden chair frame began with the careful cleaning of dirt and debris. This was followed by the removal of 20th century upholstery from the existing slip seat frame in an attempt to locate evidence of the original seat fabric. Through this process, it was determined that the slip seat frame was a 20th-century replacement, and an example of period silk upholstery was selected from 18th-century patterns to finish the chair. Check out the Drayton side chair and 26 other pieces from Drayton Hall at the DeWitt Wallace Decorative Arts Museum’s exhibit A Rich and Varied Culture: The Material World of the Early South.